As officials began to shift their focus to finding the cause of an explosion that leveled three East Village buildings last week, mourners gathered at a vigil Monday evening to celebrate the life of 23-year-old victim Nicholas Figueroa, who family members described as an adventurous spirit with a zest for life. Figueroa, a bowling alley worker, was on a date at the sushi restaurant where the explosion occurred Thursday because he wanted to try octopus for the first time, family members say. He had dreams of becoming a firefighter and was currently enrolled in a class to become an EMT. 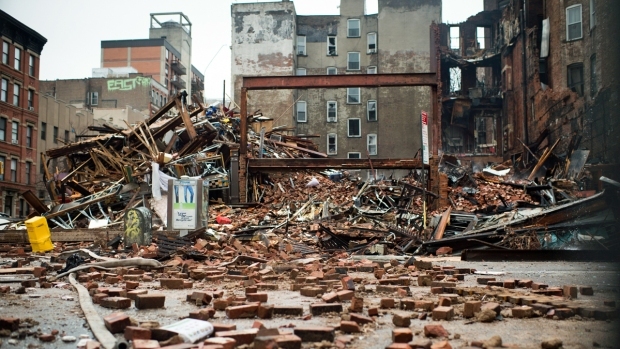 Nicholas Figueroa’s body was found Sunday by search and rescue workers scouring the debris from the explosion and fire that razed three East Village buildings last week. One of his brothers thanked and applauded rescue workers at the vigil for doing their best to find their brother. Residents have started returning to their homes days after the explosion that killed 2 and destroyed 3 buildings. Lori Bordonaro has more. Nicholas Figueroa’s date, Teresa Galarce, was also at the vigil, although she is still recovering from her injuries. Her father spoke with NBC 4 New York exclusively after she returned home. Two people had been unaccounted for following the blast, which sparked a seven-alarm fire that injured more than two dozen people, including six firefighters and an EMS responder. The other body, found about 20 feet from where Figueroa lay, requires DNA testing for official identification, de Blasio said, though family members previously told NBC 4 New York it was 26-year-old Moises Locon, a busboy at the ground-floor restaurant that exploded. Locon’s family says they plan on burying him in Guatemala pending the DNA results. Four of the more than two dozen people injured in the blast were initially hospitalized in critical condition; the mayor said Monday that three of those victims had since been released. The remaining victim was listed in good condition Monday, de Blasio said. De Blasio said Monday cleanup efforts at the blast site would shift to a more acutely investigative focus, one led by FDNY marshals, NYPD detectives and representatives from the Manhattan district attorney's office. Authorities are investigating whether the gas line in the basement below the sushi restaurant was rigged in a possible gas-theft scheme, causing a leak that prompted the explosion. Father of East Village Blast Survivor: "It Could Have Been My Daughter"
The man whose daughter was dining with one of the people who died speaks to NBC 4 New York exclusively after she returns home from the hospital after the tragedy. Jen Maxfield reports. Any lingering hotspots were extinguished by Monday and about half the site had been cleared by midday, but authorities had yet to reach the cellar level, the site of the explosion. Hundreds of people were forced out of their homes by the explosion; one couple told NBC 4 New York they returned from vacation to find they had lost everything, including their cat. De Blasio said most displaced residents had moved back in by Monday. Less than 50 units remained under vacate order, he said. The city's Department of Environmental Protection has taken nearly 200 air samples and found no asbestos. Representatives from the Department of Health were going door-to-door with informational packets for people who may need help coping with the ramifications of the explosion. "This was a tragedy, but a tragedy that also showed us the bravery and heroism of our first responders," de Blasio said. The mayor said he visited with some of those first responders Saturday and found their stories "incredibly moving," "how every second counted in saving the lives of the people in the buildings." Through the weekend, workers raked through piles of loose brick, wood and debris with tools and their hands and used dogs to search the rubble. Debris was inspected, and then placed in containers that were to be stored by the city, in case there was further need to examine them, a city official said. By midday Monday, about 3,000 cubic yards of debris -- about half the estimated debris on the site -- had been searched and removed. The 3,000 cubic yards equates to about 46 tractor-trailer loads of debris; each cubic yard weighs about a ton, authorities said. The investigation is focused on work that was being done in the basement of the restaurant more than six months ago, authorities say. In August, utility workers discovered that the gas line to the restaurant had been illegally tapped, according to Consolidated Edison. The discovery led Con Edison to shut down gas service to the building for about 10 days while the building owner made repairs. Gas service was restored after the utility deemed it safe, the utility said. Kukic — who's facing unrelated charges of bribing an undercover investigator posing as a housing inspector — declined through his lawyer to comment on the circumstances surrounding the explosion. City records show Kukic got a permit last June for plumbing, flooring, removing partition walls and other work at the building.